Positive Detroit: Applications Are Open For The 2016 Comerica Hatch Detroit Contest! Applications Are Open For The 2016 Comerica Hatch Detroit Contest! Comerica Bank and Hatch Detroit announced the return of The Comerica Hatch Detroit Contest. The 2016 contest will include an expanded benefits package for the $50,000 grand prize winner as well as additional support for entrepreneurs and Hatch Alumni. Comerica is more than doubling its commitment for the contest, investing more than $125,000 to help launch even more small business successes in Detroit and help ensure the success of current Hatch Alumni. The free workshops will provide an opportunity for entrepreneurs to work with established business owners to strengthen their business ideas, solidify their business plans and develop a contest application that will make a strong impression on the Detroit community. Comerica Bank has also expanded its commitment for contest alumni. Comerica has contributed $25,000 to the Michigan Women’s Foundation to establish a micro-enterprise loan fund offered exclusively to Hatch Alumni to help them meet short-term funding challenges. Comerica and Hatch Detroit will also host a business planning workshop later this year tailored to Hatch Alumni to address challenges related to opening and operating a storefront. The business competition seeks entrepreneurs with a retail concept to submit their business plans to establish a brick and mortar location in Detroit, Highland Park or Hamtramck. Business applications will be accepted May 2 – July 15, 2016. The winning business pitch will take home $50,000 from Comerica Bank, $25,000 in branding and logo design from global advertising agency Team Detroit, and a package of accounting, legal, IT, public relations, and counsel from Hatch Detroit and its partners. Hatch Detroit has experienced tremendous success igniting small business growth since it launched the contest in 2011. 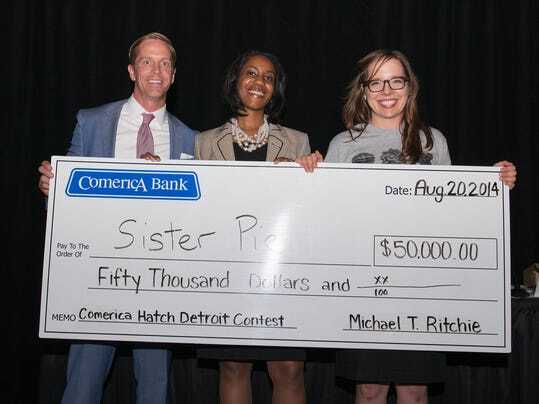 Comerica Bank became the first flagship sponsor of the contest in 2012 and has provided $200,000 in prize money as well as public relations and marketing support to Hatch Detroit and the contest alumni. The contest has garnered 1,400 business submissions with a combined 300,000 public votes that helped crown Hugh, La Feria, Batch Brewing Company, Sister Pie and Live Cycle Delight as contest winners, and helped push the doors open for numerous contest alumni including the Detroit Institute of Bagels, Detroit Vegan Soul and Busted in Detroit. Click HERE To Submit A Business Plan!